ATTLEBORO, Mass. 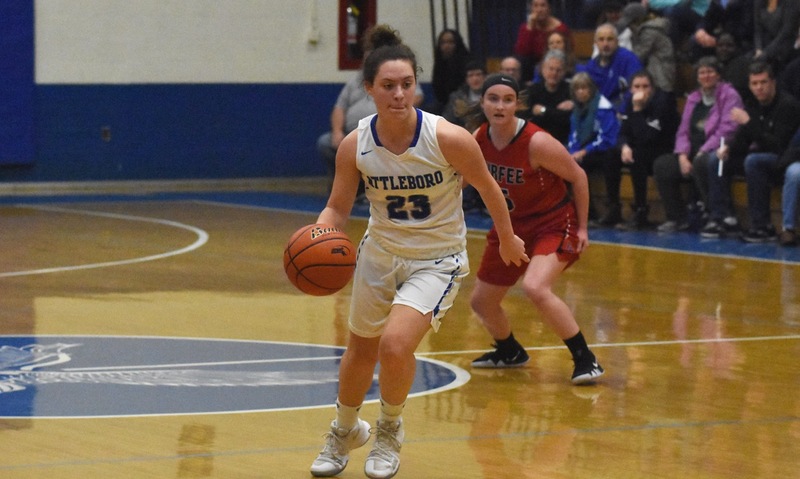 – Attleboro came into Friday night’s non-league visit of Durfee without two starters and three rotation players, but the Bombardiers didn’t miss a beat. Nine players got on the score sheet, Attleboro’s pressure defense was intense, and the Bombardiers rolled to a 55-34 victory. 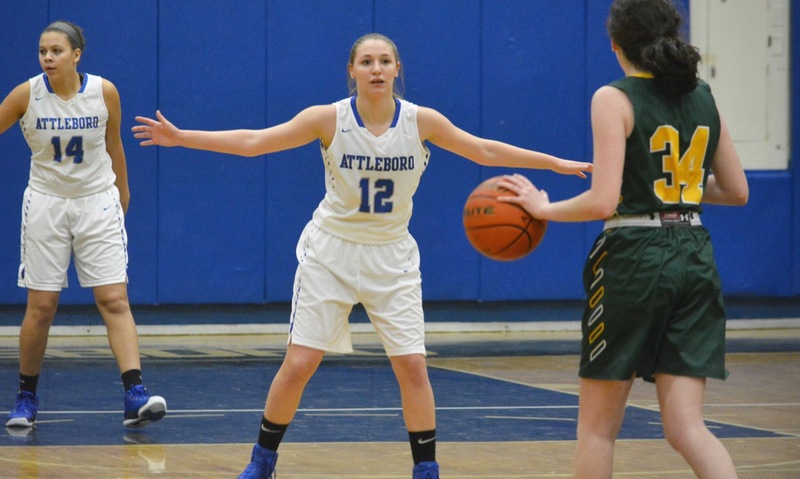 Liv McCall led the way for Attleboro with a game-high 14 points and also added five assists. In addition, the Bombardiers got contributions from up and down the bench and got critical minutes from a strong group of underclassmen. Durfee only dressed eight players on Friday and Attleboro took advantage of its shorthanded opponent with an aggressive trapping press. Without top on-the-ball defenders Jordyn Lako and Nyah Thomas, who were both injured, the Bombardiers used this team defense to cause the Hilltoppers problems. Attleboro jumped out to a 10-2 lead. Abby Struminski, one of four players to finish with six points, buried a three off an offensive rebound and assist by Mackenzie Roberts and freshman Meghan Gordon got an easy bucket off a steal. After Durfee cut the lead to 12-6, sophomore Gabby Bosh> (five points) banked in a three off a Gordon assist and then Gordon got out on the break for a layup and a 17-6 edge after the opening quarter. Things got tighter in the second because the Bombardiers went cold from the floor. 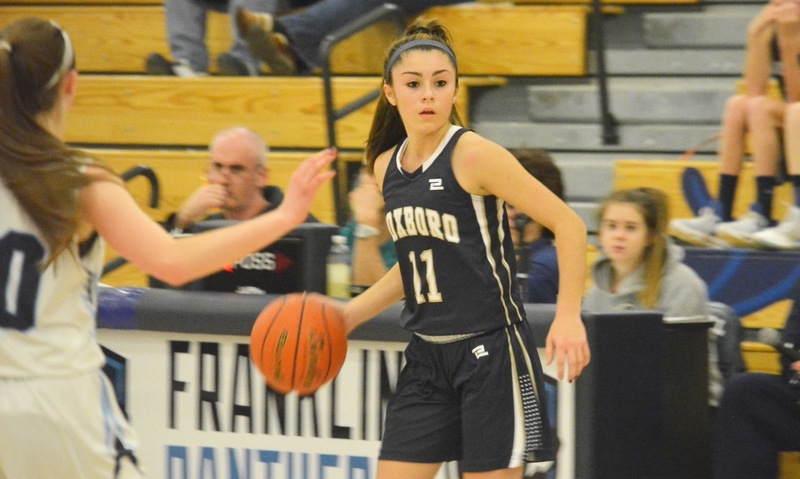 Freshman Mackenzie Carreiro scored six of her seven points in the quarter and pulled Durfee back as close as four points, but Attleboro regained control with an 11-0 run to close the half. McCall set up sophomore Ryan Johnson (six points) for a fast break basket and then Gordon drained a three to push the lead back to double digits. McCall added a steal and layup and Sonny Stuger managed to get to the basket with a drive from the elbow. The Bombardiers led 32-17 at the break. Durfee kept fighting in the third, but never got any closer than 16 points. McCall swished a three, freshman Hailey Perry (six points) got a bucket off a McCall assist and sophomore Emma Reilly (six points) scored four points in the third to keep the Hilltoppers at an arms length. The game was put away with an 11-4 fourth quarter. McCall continued to turn defense into offense with a pair of steals and fast break baskets. Reilly added another two points with an offensive rebound, Johnson knocked down a jumper, and Perry got her second made field goal of the night. It was the perfect reaction for a team missing several key pieces and a great way to head into the holiday break. Attleboro (2-3) will get six days off for Christmas break before traveling to North Attleboro for the teams’ league matchup.